Henrietta Geisenberg Bauer, my great-great grandmother, was from Bavaria, a German area noted for beautiful mountain scenery and picturesque old cities. Before Germany was unified, Bavaria was the independent Kingdom of Bavaria, located in central Europe. One of the old towns in Bavaria was Gunzenhausen, a town established in 1349. In the late 1700s, one family living in Gunzenhausen was the Jewish family of Loew Rau and his wife Jannet. Loew Rau was a Levite, so he is named in some records as Loew Levi. He was also called Loew Joseph or Loew ben Joseph, which means, Loew the son of Joseph. Loew was a vorsinger(cantor). Jannet Rau, also called by the Jewish name Schoela, had a maiden name of Ziegenheimer. Her family was from another Bavarian town named Oettingen. Loew and Jannet had sons named Moses and Jacob and daughters named Bessla, Kehla and Feila. Bessla was born about 1788 in Gunzenhausen. When she was about 25 years old, Bessla married for the first time. Her husband was Solomon Griebel, Hebrew name Solomon Lazarus, from the Bavarian village of Bibergau. Their wedding took place Oct 18, 1814, in Bibergau, and after the wedding, Bessla and Solomon made their home in Bibergau. Bibergau, which means “Beaver District,” is a few miles east of the larger town or city of Wurzburg, in Bavaria. Wurzburg had been a principal Jewish community since the year 1000 CE. By 1816, Bibergau had a population of 499, of whom 131 (26%) were Jews. In January 1816 Bessla and Solomon became the parents of a son, whom they named Lazarus. According to the common Jewish naming practice, their son Lazarus was named for Solomon’s deceased father. In 1818 another son was added to the family. Solomon and Bessla named this son Low. According to the common Jewish naming practice, naming Low for Bessla’s father indicates that Bessla’s father, too, was deceased. The rise of German nationalism in the 19th century was tainted with anti-Semitism. In 1819 one anti-Semitic persecution that broke out was called the “Hep! Hep! Riots,” where Jews were taunted with the cry of “Hep, Hep,” an acronym for the phrase “Jerusalem is lost.” Rioting started with university students in Wurzburg, where Jewish shops were looted and several Jews killed. Unrest spread throughout Germany. How these events affected Bessla and Soloman, I do not know. However, it was in the same year as these riots, in March 1819, that Solomon died. Solomon Griebel died at the age of 30 years, leaving his widow Bessla, 31 years, and their two sons: Lazarus, 3 years, and Low, a year old. Two years later, Bessla remarried. Bessla’s second husband was Simon Geissberger, or Geissenberger, whom she married on May 21, 1821, in Bibergau. The groom was 31 years old; the bride was 33 years old. Simon Geissberger, born about 1790 in Bibergau, was the son of Marx and Jenta Geissberger. Marx Geissberger, born about 1750, had been about 40 years old when Simon was born. Marx was a schutzjude of Bibergau. Shutzjude is a Jew who enjoyed some privilege, as, for example, a Jew who was allowed by exception to live where Jews were not ordinarily allowed to live. By the time that his son Simon married Bessla in 1821, Marx Geissberger was 71 years old and a widower. Simon and Bessla’s family grew with the births of two sons, namely: Isaac, born 1822, and Joseph, born June 16,1825. Bessla did not survive Joseph’s birth, and died on June 23, 1825, at age 37. Simon and Bessla had been married for just four years. Simon was left a widower with four children, namely, Lazarus (Griebel), 9 years, Low (Griebel), 7 years, Isaac, 2 years, and Joseph, a newborn infant. On March 20, 1826, nine months after Bessla’s death, Bessla’s younger sister Kehla, from Gunzenhausen, married Simon in Bibergau. At that time, Simon was about 35 years old, and his bride Kehla, about 25 years old. Sadness hit the family only a few months later, with the death of Low Griebel, 8 years old, in November of that year. Kehla was already expecting her first child by then. In March 1827, only weeks shy of her first wedding anniversary, Kehla gave birth to a daughter they named Carolina. Sadly, Kehla did not survive the birth of her daughter. She died March 3, 1827, in Bibergau, at age 26. Simon was again left a widower with four children, namely Lazarus (Griebel), 11 years, Isaac, 4 years, Joseph, 1 year, and Carolina, a newborn infant. Simon was a single father for 18 months following Kehla’s death. It must have been a difficult time. In July of 1828, little Joseph, 3-year-old son of Simon and Bessla, died. Two months later, on September 26, 1828, Bessla and Kehla’s sister Feila, called “Fanni,” married Simon in Bibergau. Described in the Bibergau records as the widower of Bessla and Kehla, Simon was now 38 years old. I do not know Fanni’s age. Simon and Fanni’s household numbered five, with three children, namely, Lazarus (Griebel), 12 years, Isaac, 6 years, and Carolina, 1 year old. Simon and Fanni were married for 36 years and had 11 children, born in the years 1829 to 1845. Some of the children in the family died in childhood. Fanni and Simon named their firstborn son Low, the name of Fanni’s father Low Rau and Fanni’s little nephew Low Griebel who had died in 1826. Fanni’s son Low was born in February and died in August 1829. Carolina, the only child of Simon and Kehla, died in 1840, at the age of 13 years. And Simon and Fanni’s children Schela, Samuel, and Marle died shortly after their births, in 1841, 1842, and 1843. Simon’s father Marx Geissberger, age 84, died in 1835. The book Vital Records of the Jewish Community of Biebergau, 1812 to 1875 records the birth of Jandel Geissberger on Feb 12, 1830, daughter of Simon Geissberger and Feila his wife, maiden name Rau, from Gunzenhausen. In addition to the Yiddish name given to her at her birth, Jandel had two other personal names in her life. Her Hebrew name was Hannah bat (daughter of) Simon. In the United States, she was known by the name Henrietta (German spelling Henriette). For clarity and continuity, I will refer to her only as Henrietta. Henrietta was born just a year after her brother Low had been born, and six months after he had died in infancy. She was a middle child in the family, with Lazarus (Griebel) 14 years older than she, Isaac, 7 years older, and Carolina, 3 years older. Then there were her nine full siblings, of which she was the oldest, who ranged from Rifka, 2 years younger than she, to Joseph, 15 years younger than she. When Henrietta was 10 years old, her 13-year-old sister Carolina died. As an 11, 12, and 13-year-old, she saw three of her siblings die soon after they were born. Marx Geissberger, Henrietta’s elderly widowed grandfather, died in Bibergau at age 84 on Jan 30, 1835, when Henrietta was only 5 years old. Low Rau possibly died before 1818, as a grandson was named for him in 1818. Henrietta likely never knew or could remember any of her grandparents. Many questions remain about Henrietta’s youth. Did she receive any type of education? Did her family embrace the new Reform Judaism? Did her father have a store that he ran, and, if so, did Henrietta learn to be a merchant from him? What did she hear about the United States of America? How did she come to leave her home and family for America? Many Jews took part in the 1848 revolutionary uprisings in Germany. And some Jews left for America. Bavaria was one of the main regions from which Jews came to America, and Bibergau was one town from which Jews left. By 1867, among 549 population of Bibergau, only 91 Jews (17% of the population) remained. At this time, in fact from the 1820’s to about 1880, Jewish immigration into the US almost entirely was made up of immigrants from Germany. Several of Simon’s children were among those Jews who came to America. [ii] Joseph Geisenberg and his sister Lea (Lena) Geisenberg, who married Samuel Shuster, came to the South and settled in Memphis, Tennessee. Isaac Geisenberg, son of Simon and Bessla, married a young woman named Harriet Dreyfus, also from Bavaria, in Vicksburg, Mississippi, on Dec 1, 1849. The couple settled across the Mississippi River from Vicksburg in the community of Milliken’s Bend, Louisiana, and Isaac became first a planter and then a grocery keeper. And Henrietta Geisenberg came to Milliken’s Bend, too. Henrietta married Leopold Bauer, also from Germany, and the couple settled at Milliken’s Bend, Louisiana, in the same community as Henrietta’s brother Isaac and his family. The Bauer name was often spelled Bower or Bowers. Milliken’s Bend, also called “the Bend,” was a community located about 20-25 miles north of Vicksburg, on the western bank of the Mississippi River in Madison Parish, Louisiana. In keeping with the practice of the time, the village had been named for the largest property owner at that bend in the river, John Milliken. In the years before the Civil War, the western movement was in progress, aided by steamboats on the Mississippi River. From its beginning in 1811, steamboat traffic on the Mississippi River steadily increased. Gertrude Philippsborn, a local historian of the Vicksburg, Mississippi, area concluded that people moved to Millikin’s Bend because it was the big harbor for Vicksburg and money was made there. “Other steamboats helped make life enjoyable for Madisonians. These were the huge and famous Showboats, some carrying a full complement of circus entertainment that was quite comparable to shows traveling by rail. They had elephants, menagerie, ring performers and everything else comprising a circus. It often took a day and a half to disembark and set up the show. There were also roads in the Parish, dirt roads that were dusty in dry seasons and muddy axle-deep in wet seasons. Plank bridges lacked railings to prevent horse-drawn vehicles from falling over the sides. In the 1840s and 1850s enterprising private operators began ferry service across the Mississippi to Vicksburg. Many people moved to Madison Parish, both white and slave. In 1840, the white population of the parish was 1,210 and the black population was 3,923; by 1860, the whites in Madison Parish numbered 1,293 and the blacks, 9,863. Jewish settlers also came to the Vicksburg and Millikin’s Bend area. They came overwhelmingly from German areas, such as Bavaria, Baden, Alsace-Lorraine, but also Prussia. Gertrude Philippsborn, historian of the Vicksburg Jewish community, herself from Germany, noted a certain similarity between the lovely wooded bluff on the Mississippi River at Vicksburg and the bluffs overlooking the Rhine, Main, Neckar, and Donau rivers in Germany, on which the German Jewish old home towns were located. When the settlement of Walnut Hills was incorporated in 1825 as the city named Vicksburg, there were twenty Jewish families living in the town. Three Jewish brothers surnamed Sartorius moved to the area in 1835, 1840 and 1845, and brought two Torah scrolls. These were the first Torah scrolls in Vicksburg. In 1841, the Jews of Vicksburg formed a congregation called the Hebrew Benevolent Congregation of the Men of Mercy. Beginning in 1845 a second wave of Jewish immigrants came. Again quite a number of them came from Germany, including Isaac and Henrietta. Trains also came to Madison Parish. The Vicksburg, Shreveport and Texas Railroad Company was created in March 1852, by the Louisiana legislature. This line was to extend from the Mississippi River on the Louisiana shore opposite Vicksburg westward to the Texas border. Construction began in Madison Parish on August 8, 1854. The construction of this railroad was ultimately disastrous for the future of Milliken’s Bend because the train did not run through the little port town. Nevertheless, the railroad was good for the Parish, and Leopold and Henrietta may have attended the celebration in September 1857. Henrietta was in the last months of pregnancy at that time. Jennie, born 14 months later, on Dec 17, 1858. By census day, June 1, 1860, Henrietta was single. One record says that Henrietta and Leopold divorced and that Leo moved to St. Louis. Henrietta is said to have remarried a Louis Smith, who died shortly thereafter, and was the father of her son. Government documents agree that Mrs. Bauer’s husband died before the war, but seem to know only the name Bauer, not Smith. Whatever the other facts, it is certain that by June 1, 1860, Henrietta was single and expecting a child. Henrietta had a grocery store in Milliken’s Bend and a dwelling house just behind the store. The 1860 federal census gives the following information about Henrietta: female, age 28, occupation “merchant,” value of personal estate “$1000,” born in “Bavaria,” daughters B. age 2 and Jennie age 1. On the 1860 federal census, Henrietta’s family is enumerated as household # 45. Household #37 is the Isaac Geisenberg family, including Isaac, his wife, two sons and two daughters. Incidentally, household #46 in the village of Milliken’s Bend was that of Dr. Henry Wirz, a physician born in Switzerland. Likely it was in late 1860 when Henrietta gave birth to a son she named Louis. Louis appears to have used the surname Smith during his childhood, including on the 1870 federal census. However, he identified himself as Louis Bowers as an adult. On Jan 9, 1861, Louisiana and Mississippi seceded from the Union. On March 21, 1861, Milliken’s Bend was incorporated. The village had a white population of two hundred. Milliken’s Bend and the surrounding areas, drawing trade from the wealth of the plantations, had reached the peak of its prosperity. With the coming of the War Between the States, cotton became almost worthless. Slaves ran away and the Emancipation Proclamation in 1862 freed them. A key to conquering the South was to capture Vicksburg on the Mississippi River, cutting the Confederacy in two and depriving the eastern Confederate states of supplies from Texas and Mexico. Vicksburg, however, could withstand Union efforts to capture it from the water. General Grant saw the importance of Milliken’s Bend, a mere 20-25 miles from Vicksburg on the Louisiana side of the river, and hoped from there to capture Vicksburg. General Sherman took his Union troops to Milliken’s Bend as early as Jan 1, 1862, where the Union troops found beautiful homes abandoned by their Confederate owners. Soon thereafter, both Union and Confederate troops were foraging on the countryside. The construction of the railroad, on which trains were regularly running to Monroe, Louisiana, over 75 miles of track, ceased in 1861. When the Union army came to the area, the Confederate army destroyed the tracks to Monroe in order to prevent the Union army from using it. For their part, the Union army burned the railway stations at Tallulah and DeSoto, Louisiana, the town across the Mississippi River from Vicksburg. The sources for information about Henrietta’s life during the War Between the States are Thomas Staten, Washington West, Lizzie Reed, Green Rider and Turner Johnson, all black citizens who lived through these troubled war years. Before the war Henrietta’s husband told Thomas Staten that he did not believe in slaves. The Bowers never owned slaves; they hired what they did not do themselves. While Henrietta lived at Milliken’s Bend during the early months of the war, presumably because of her position on slavery, the Confederates would have nothing to do with her, the Southern soldiers ran her off, and she needed protection. Henrietta moved to Island 102 after the Union army came to the Vicksburg area. Island 102 was an island in the middle of the Mississippi River, about 4 miles above Milliken’s Bend, where nearby Union soldiers could protect the family. Union headquarters was at Young’s Point—about 12 miles from where Henrietta lived. Henrietta, widowed when she moved onto Island 102, was just 32 years old, and her daughter Bettie was about 5 years, Jennie, 4 years, and her son Louis, about 2 years old. On Island 102, Henrietta lived on her own place, bought before her husband died. There were about 100 acres cleared; mostly the property was woods. Henrietta’s was the only white family living on Island 102. Most whites had run away to Texas. Henrietta hired black people, including Washington West and Thomas Staten, to cut wood from her property and she had a big wood yard at her place from which she sold wood to citizens’ boats. Mr. Fisher, a white man, was keeping the landing for her. Thomas Staten, who was in his twenties during the war, said that “during the war when Mrs. Bauers moved over onto the island, some of us followed her over there to be with her. She was a woman that worked hard herself; she would wash and iron and cook and milk her cows and work in the garden or field if it was necessary. She was not like most the white ladies around here.” Thomas Staten lived on Henrietta’s place on Island 102 for 2 years. She had told him that she would not have slaves, everybody had a right to be free. Many times she had said she wanted all the people to be free and work for themselves like she did. Green Rider, his mother, and his Uncle Coleman lived on the island during the war. Green’s uncle hauled wood and headed up the wood yard for Henrietta. Green and his uncle stayed on Island 102 for 3 years. Green, who was about 14 years old at the time, minded the stock for Henrietta. Lizzie Reed also lived on Henrietta’s place on Island 102 during the war, to keep from getting killed by the guerillas. Turner Johnson was in the 49the Infantry, a black Union Army unit. He would visit black people on Island 102. Those he would visit told Turner Johnson that Henrietta was a good woman for them to be with, that she treated them right and was on the Republican side, that she was on their side. Henrietta had been living on the Island for a while when, in 1862 and again in 1863, Union soldiers confiscated her goods. The Union soldiers took 600 cords of wood worth $5 each, 50 hogs worth $5 each, 5 cattle worth $30 each, and 500 bushels of corn worth $1.50 each. Lizzie Reed and Thomas Staten saw the Union boat take the flat boat loaded with corn being brought from Island 102 to Milliken’s Bend. “ . . .Henrietta Bauers was opposed to the war and secessison and favored the Union cause. She was compelled to hide from the Confederates or guerrillas through fear of them. By reason of her expressions in favor of the Union cause she had to leave Madison Parish, Louisiana, and remove to what was known as Island No. 102. Among her neighbors she was known as a Union sympathizer. Generals Grant and Sherman prepared to take Vicksburg with about 30,000 troops. The last stages of the Vicksburg campaign began in May 1863. On June 7, 1863, a little-publicized battle was fought hand-to-hand with bayonets at Milliken’s Bend. The encounter resulted in over a thousand casualties. Philippsborn reports that the first soldier wounded in this campaign was Philip Sartorius. Robinson reports that the battle marked the first major conflict between Union black troops and the Confederate army. After being held under siege for weeks, Vicksburg was surrendered to Grant on July 4, 1863. Henrietta and her three children stayed on Island 102 in 1864. Perhaps Henrietta followed the wartime career of her former neighbor Dr. Henry Wirz. During the war, Captain Wirz commanded the Confederate prison at Andersonville, GA. In Germany, Henrietta’s father Simon Geisenberg died April 4, 1865, at age 74. He was buried in Schwanfeld, a town about 8 miles from Bibergau, in the Jewish cemetery purchased in 1579 and used by the Bibergau Jewish community for hundreds of years. In the States, on April 9,1865, Lee surrendered to Grant at Appomattox Court House. On the night of April 14, Lincoln was shot, and he died on the morning of April 15, 1865. In November 1865, Captain Henry Wirz, the physician from Switzerland and Henrietta’s neighbor in prewar Milliken’s Bend, was hanged in Washington, D.C. The United States executed Captain Wirz, age 43, for the deaths of almost 13,000 prisoners who died during the war at the Andersonville prison under the administration of Captain Wirz. After the war, Henrietta returned with her children to Milliken’s Bend. The war had been bad, but the period of Carpetbag Rule following the war is said to have been worse and has been described as chaos. Henrietta’s life must have been chaos, as she was adjudicated bankrupt at this time. After several years Carpetbag Rule was overthrown and a new era began. From 1870, the little town of Milliken’s Bend grew rapidly and became as prosperous as it had been before the war. Joseph “Joe” Witherow was an Irish Protestant immigrant and Southern war veteran who settled at Milliken’s Bend at Henrietta’s place. Henrietta was owner of a cotton farm and general merchandise store, as well as the widowed mother of her two girls—Bettie and Jennie, and her young son, Louis. Joe clerked and finally became part owner and manager. “The town was made up of two business streets. One was atop the levee (the levees, then, were narrow and but a few feet in height) with its buildings all facing the land side, their fronts flush with the top of the levee, their rears toward the River and resting on piling, where the water —- when the River was out of its banks and against the levee —- flowed beneath them. On this street there were only four business houses. Beginning at the north end of the street, they were: McClellan and Coltharp’s Cash Store; Price’s Bar Room; the Feist Grocery; and The Henry Weidaman Grocery. Although steamboat traffic had been disturbed during the war years, afterwards it resumed until several steamboats passed Milliken’s Bend each day. These boats would stop to disembark passengers or freight or to load them when flagged by the landing keeper. Life returned to normal in Vicksburg, too. Regarding the Vicksburg Jewish community, in 1862 the Hebrew Benevolent Congregation of the Men of Mercy was formally incorporated in Mississippi as “Congregation Anshe Chesed.” After the war, at the high holidays of 1866 or early in 1867, the congregation hired Rabbi B. H. Gotthelf, a native of Germany, from Louisville, Kentucky. In 1868 Congregation Anshe Chesed broke ground for a new Temple. There were 90 Jewish families in Vicksburg, who owned about 35 stores. In May 1870, Anshe Chesed’s Temple building, the first Jewish Temple in the state of Mississippi, was completed and a ceremony of dedication was held. The celebration was complete with a procession under the direction of a Grand Marshall. Following the service of dedication, a Grand Dedication Ball was held. Americans had strong pro-German feelings in 1870—at the dedication ceremonies at the Temple two hymns were sung in German. Did Henrietta and her son travel to Vicksburg for the auspicious occasion of the dedication of the new Temple? If she did, was she overcome with feelings upon hearing Jewish hymns sung in her native German language. The June 1870 federal census for Madison Parish, Louisiana, enumerates Joseph Witherow, 30 years old, grocer, born in Ireland, $7500 value of personal estate; Henriet Bowers, 30 years old, home keeper, born in Germany; and her child, 7 years old. Henrietta’s daughter Bettie, 14, was attending school in New Orleans. Daughter Jennie, 11, was attending school in Memphis, Tennessee, and living with the Shuster family, that is, with Jennie’s Aunt Lena Geisenberg Shuster and Uncle Samuel and with her cousins Henriette, Dora and Florence. In spite of the growing prosperity of the area, Henrietta had lost all her property during the war and was unable to raise sufficient money to meet the expense of taking testimony for her claim. Henrietta’s daughter Bettie, attending school in New Orleans, met James “Jim” Witherow, the younger brother of Joe Witherow. Jim came to New Orleans from Ireland in 1856, worked on the NO & Jackson Railroad under Union General Ben Butler during the war, and continued to follow railroading after the war. Bettie, age 15 years, and Jim, age 28 years, eloped, marrying in New Orleans on May 23, 1873. The couple set up their home at Waggaman, Jefferson Parish, across the Mississippi River from New Orleans. Henrietta’s first grandchild, Bettie and Jim’s daughter Henrietta Jane Witherow (called Hennie) was born July 18, 1874, at Waggaman, La. The following year, Henrietta’s first grandson Joseph Francis Witherow was born in December 1875. Did the new grandmother, perhaps with her daughter Jennie, make trips to Waggaman to help the new mother and cuddle the new babies? Given that Bettie was only 16 years old at the birth of her first child, I suspect that she did. Perhaps Henrietta wrote to her mother Fanni about Fanni’s American great-grandchildren. Fanni continued to live in Bibergau as a widow after the passing of her husband Simon; her burial in the Schwanfeld Jewish Cemetery is recorded as taking place on January 4, 1876. 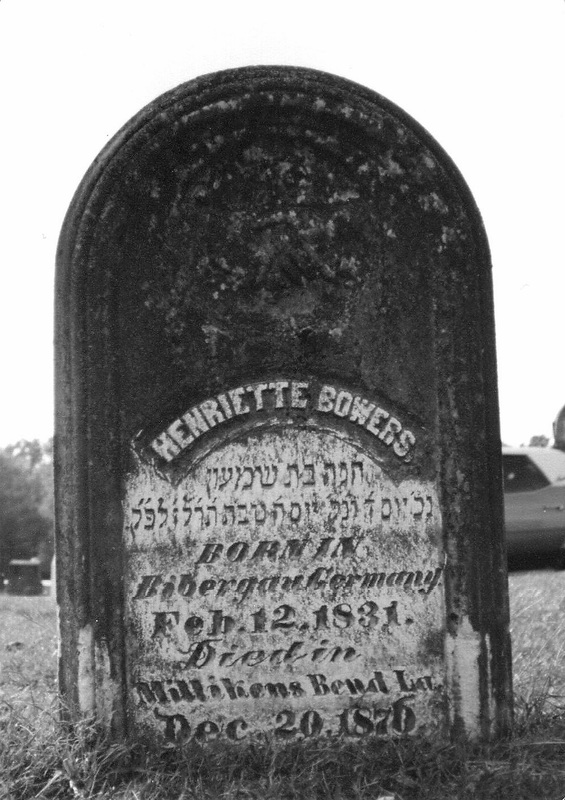 Henrietta Geisenberg Bauer died Dec 20 or 21, 1876, at Milliken’s Bend, La., at the age of 46 years, and her body was taken to Vicksburg for burial in the Anshe Chesed cemetery. Grave number 137, indicating the Jewish cemetery, is registered in the name of Levy and Schuster. The Mr. Brown who paid the $15 expense is probably Isaac Brown, a president of the Temple. The Kiersky brothers bought the tract of land where the Jewish cemetery is located in 1862. The site was the scene of heavy and important fighting in the siege of Vicksburg in 1863. The brothers were so upset that, when the opportunity arose to sell the land to Temple Anshe Chesed as a cemetery, they sold it, in August 1864. Tombstone of Henrietta Bauer (Bowers), Anshe Chesed cemetery, Vicksburg, MS.
On the top of Henrietta’s tombstone appears to be a clasped hands design. Below the design on the tombstone is a line of Hebrew writing. Henrietta’s name on her tombstone reads in the Hebrew script “Hannah daughter of Simon.” Also in Hebrew is given her date of death (4 Tevet) and date of burial (5 Tevet) and the year, according to the Jewish calendar. Twenty-seven days after her mother died, leaving her alone in the family home, Jennie Bauer, aged 18, married Joseph Witherow, aged 37, on January 17, 1877, in Vicksburg, Mississippi. Levi M. Lowenberg, JP, officiated. Joseph and Jennie became the parents of four children: Carrie, Etta, Morris and Louis. Jim and Bettie’s family grew to include seven children: Henrietta (Hennie), Joseph, Maude, James, Bertha, Ida, and Milton. Louis Bowers married Ida Fitler and they became the parents of three chidren: Theodore Henrietta, Louis and Charles. The Isaac Geisenberg family moved to Trenton, Louisiana, in the early 1860’s where Isaac died in 1863. Isaac’s widow Harriet remarried and shortly thereafter was again widowed. Harriet resumed the use of the name Geisenberg for the rest of her life. This practice of resuming the prior surname may explain why Henrietta, briefly married to Louis Smith after her divorce from Leopold Bauer, resumed the use of the surname Bauer after Louis Smith died. Lena (Lea Geisenberg) Shuster and her husband Samuel, Joseph Geisenberg and his family, and Isaac Geisenberg’s widow Harriet settled in Memphis, Tennessee. As adults, Henrietta’s children Bertha Witherow, Jennie Witherow, and Louis Bowers pursued Henrietta’s claim for property taken without compensation by the Union army during the war. The government file does not reflect the disposition of the claim. In 1880 most of the inhabitants of Milliken’s Bend relocated to a new site one mile west of the old town, due to encroachment by the river. The original site of Milliken’s Bend has ceased to exist since the last family left in 1916. The Joe Witherow family left the “old” Bend in 1910, the next to last family to leave. The course of the Mississippi River has changed over the last hundred years, and the site of “old” Milliken’s Bend is now on the east bank of the river. By 1900 Island 102 had mostly washed away onto the Louisiana shore. The Jewish cemetery at Schwanfeld, the final resting-place for the Geisenberg family in Germany, is today in very good condition, maintained by the Hempel family. The Anshe Chesed cemetery is adjacent to the Vicksburg National Military Park. The restored Ark and eternal light from Temple Anshe Chesed of Vicksburg is now at the Museum of the Southern Jewish Experience, Utica, Mississippi. Bass, Alice Cabaniss. “Southern Exposure.” Hadassah Magazine. April 1991, p. 32-33. Gilbert, Martin, consulting editor. The Illustrated Atlas of Jewish Civilization: 4,000 Years of Jewish History. 1990. Historic Names and Places on the Lower Mississippi River. Dept of the Army, Corps of Engineers. 1977. Philippsborn, Gertrude. The History of the Jewish Community of Vicksburg (From 1820-1968) 1969. Register of the Funerals of the Schwanfeld Jewish Cemetery. The Central Archives for the History of the Jewish People. Robinson, Frances Alexander. “Curtains for the Bend.” 1941. Madison Parish Home Page. 1999 Richard P. Sevier, editor. Sevier, Richard P. “Earliest Settlers in Madison Parish.” Madison Parish Home Page. 1999. [i] Since Simon was about 30 at the time of his marriage to Bessla, the question arises whether Simon, like Bessla, had been previously married. It is possible that Simon had previously married and that he had fathered two children, a son born in 1816 named Moses and a daughter born in 1820 named Henrietta. A marriage, the birth of children, or the death of a wife prior to 1821 is not recorded for Simon in the book Vital Statistics of the Jewish community of Biebergau 1812-1875. Although Bessla is described as a widow at the time of her marriage to Simon, Simon is not described as a widower. Steven Geisenberger, a great grandson of Moses Geisenberger and family researcher, concludes that there is no proof at this time that Moses and Henrietta were Simon’s children from a first marriage. In the 1970’s Florence Geisenberger, a granddaughter of Moses Geisenberger born in 1885, strongly denied Moses’s connection to the documented Bibergau-born children of Simon Geisenberger. The one document connecting Moses and Henrietta Geisenberger to Bibergau is a family Bible containing a birth entry for Moses. That entry, made no earlier than 1857 but perhaps much later, records Moses Geisenberger’s birth in May 1816 in Bibergau. The same Bible records Henrietta Geisenberger’s birth in 1820 in Traustadt. No father’s name is given in the Bible for Moses or Henrietta. Again, the Bibergau register does not support the birth of any child to Simon in 1816 or 1820. If Simon Geissenberger did father these two children, then Bessla and Simon began married life as a household of six, namely Simon and Bessla, and her sons Lazarus (Griebel), 5 years, Low (Griebel), 3 years, and his son Moses 5 years, and his daughter Henrietta, 1 year old. [ii] Moses Geisenberger immigrated in 1839. He and his sister Henrietta Geisenberger were living in Lancaster, Pennsylvania, in 1850.